The final week of WEF the team headed to The Ridge and Blackwatch Farm to Compete in numerous classes. New student Quintyn Baeumier and Zandor competed for the first time, having top 3 placings in the 0.8m and 0.9m classes! Claire Wen also took out her 3 horses in the 1.20m division, also receiving top placings, her first time jumping the 1.20m class with Une Belle Fluer and Acardi. Paramount also was at the top in the 1.20m divisions. Sam Walker also took new horse Carlitzek N out in the 1.40m Grand Prix, as well as Gangsters first Grand Prix where he jumped a super round with just one down. Now the team gets prepared to head back north for the Canadian circuit! Claire Wen and Acardi took home their first win last week during WEF 9! The pair jumped a super double clear effort to end up winning the class in the Adult Amateur 1.15m class! More wins to come for this pair! Congratulations to the Wen family who have purchased two new horses! Une Belle Pomme and Carlitzek N! Une Belle Pomme or Belle will be competed by Claire Wen with goals to reach the high amateur jumpers! Carlizek N or Prince will be competed by Sam Walker in the Grand Prixs until he is ready to be Claire’s U25 horse! Forest Hill Team is very excited to start working with these two new superstars! Super week 7 at Palm Beach International Equestrian Centre! Claire Wen and Acardi had a super double clear effort in the $10,000 Adult Amateur Classic to finish 5th! Sam Walker and Gangster also had a nice double clear effort in the $10,000 Medium Junior Classic to also finish 5th! This week Coralissa and Sam Walker will be showing in the U25 class, and Katherine Padilla and Notre Etoile Royal Flush will be showing in the Adult Amateurs! Nations Cup Week for Sam and Coralissa! Sam Walker and Coralissa had the opportunity to ride for Team Canada’s Young Rider Nations Cup Team last week at DeerRidge Farm! The competition starting with a warm up class which the pair jumped a super clear round. Nations Cup day had 2 rounds over the 1.45m course, with only three riders and no drop score Sam rode as the anchor rider. Sam and Coralissa jumped a super clear first effort, and a nice 4fault second round effort. Super results for the young talented mare! Maddy Daniels Makes Her Show Debut! During WEF week 6, or “Hunter Week” Maddy Daniels riding Hat Trick made her show ring debut! Maddy showed Hat Trick in the Older Cross Rail Hunters. The pair picked up a 2nd and 7th over fences, and a 4th in the under saddle! Super start to the season for these two! Claire Wen had a super week with her own Paramount in the Adult Jumpers. They finished the week with a super double clear effort in the 1.15m classic, finishing 3rd. Claire also got to show Acardi in the adult this week, also producing a clear round. More top results for Claire and both her horses to come! Busy WEF week 2 for the Forest Hill Team, with lots of showing! To start the week off young horse Foolproof MBH owned by MarBill Hill Farm and Dee Walker showed in the 2’6 hunters, this was the pairs first show of 2019. Foolproof was a perfect gentleman and laid down some beautiful trips along with receiving a 6th place finish in the under saddle. Kenya had her 2019 debut with Coconut at Black Watch Farm, showing in the Rising Star division. The pair had a super round, and will be returning to the Ridge Turf Tour on Friday to compete again! This weekend we will also be seeing Sam Walker showing in the U25 division with Coralissa (owned by Marbill Hill Farm) as well as Gangster (owned by Claire Wen) will be making his 2019 debut in the Low Junior Jumpers. Claire Wen will also be competing this weekend abroad her own Paramount. Client Maddie Daniels has also arrived back in Wellington, and is excited to get back to gearing up towards her goals for the 2019 circuit! Claire Wen and her own Paramount rounded up the weekend showing in the Adult Jumpers. The pair concluded their successful weekend with a clear jumping and one time fault in the Adult Classic. Super result for this pair! Forest Hill Farm is gearing up for WEF Week 1 at Palm Beach International Equestrian Centre. This weekend Claire Wen will be showing Paramount in the Adult Jumpers, and Sam Walker will be showing Coralissa in the High Juniors. Forest Hill Farm also has numerous sales horses available to be looked at an tried. We have everything from hunters, jumpers and equitation horses. Contact us for any inquires! Sam continued his winning ways in the equitations, this time in Canada aboard Willem. The pair ended up winning all 3 phases of the CET Medal Finals, making them overall winners! Special thanks to Castlewood Farm for allowing us to use Willem, and Missy Clarke and John Brennan for their assistance! Julie McDonell and Heavenly, owned by MarBill Hill Farm take home reserve champion at The Royal! The pair were Grand Hunter Champion in 2017, securing their spot for this years competition. Therefore the team only competed a few weeks this summer due to conflicting schedules. But that didn’t stop this team from excelling and preforming to a top level! Congratulations Julie! Congratulations to Kendal who made her return to The Royal Agricultural Fair, for the first time in 17 years! Kendal was aboard MarBill Hill Farm’s Heavenly and competed successfully in the Younger Adult Amateurs. Highlights include a 2nd place finish in their opening class, and a 7th place finish in the Stake Class! Sam and Waldo made history becoming the 3 male to win the coveted Maclay Finals championship. Sam also became the 4th Canadian rider to ever win. Besting a field of 175 riders, Sam went on to flat phase, where the top 25 riders are brought back to flat then a second round of jumping. The top 6 riders are then taken back for the final testing, where Sam sealed his win! Special thanks to the entire team at North Run for all their assistant, and to Missy Clarke, and John Brennan who not only train Sam, but own the talented Waldo. Congratulations to Buxton Farm and Patricia Raynes on the sale of Houdini, who was sold just before Indoor Finals. Houdini won almost every equitation class entered in the summer. He also saw numerous success in the hunter derbies. Though we will miss having Houdini in the barn, we look forward to watching this superstar horses continued success. Claire had a great show with her own Paramount stepping up to the 1.20m Division. The pair jumped a super double clear round in the indoor at Caledon Equestrian Park, resulting in a 3rd place finish. Looking forward to watching this pairs continued success. Acardi took home top honours Saturday night in the final Grand Prix of the summer. The class only saw 2 clear first rounds, leaving Acardi as the only horse to finish double clear! Super finish for an awesome summer with this horse producing numerous clear rounds in the grand prix level, including the 2* Grand Prix’s, which was his rider Sam Walkers first year at that level. Houdini continued his winning ways, winning the OHJA Medal Finals during Fall Festival at Caledon Equestrian Park. The OHJA Medal Finals was held indoors as a night feature class, over a difficult track. Next stop for Houdini is The Royal Agricultural Horse Show, where he will compete in the CET Medal Finals, as well as the hunter derby. Jorgii Mitri had a super week showing pony Glen Carin in the 0.9m Junior Jumpers. The Pair jumped a clear first round in the $10,000 Pan Am Challenged, their first time in the Grand Prix Ring! This team has worked incredibly hard all summer to improve, and their hard work has paid off! 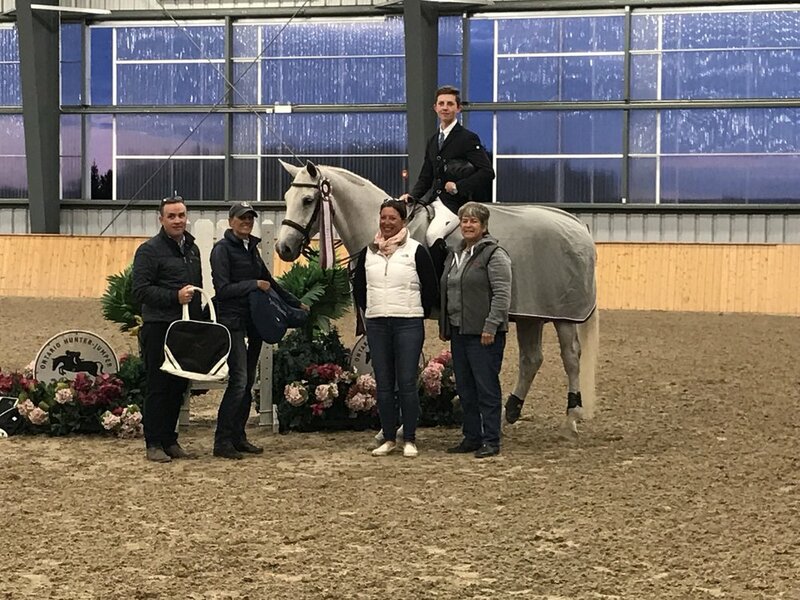 CET Medal Regionals took place last week at Caledon Equestrian Park, where Sam Walker and Houdini continued their winning ways! The phase consisted of a flat/gymnastic phase, which the pair took home top honours. The next phase was the jumping phase, which proved to be no match, keeping the pair on top with just a ride off between the overall top 6 riders. The ride off had riders go in reverse order, leaving Sam and Houdini to complete the shortened track last. The pair won the 3 phase to secure their spot at CET Finals at The Royal Winter Fair! Very proud of Houdini winning every equitation class this summer, his first summer competing in the equitation divisions! Forest Hill Farm was first founded in _____ by Scott and Dee Walker.